One afternoon, I decided to clear my mind and pay a brief visit to the Hagia Sophia, the monumental edifice in the ancient heart of the city. The "Holy Wisdom" is almost 1500 years old, and is -- at least in my amateur opinion -- the single greatest masterpiece of Byzantine architecture. 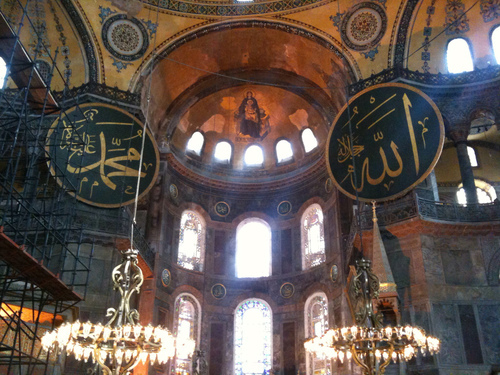 Hagia Sophia is a former Orthodox basilica, constructed between 532 and 537 by Byzantine Emperor Justinian. It remained the largest cathedral in the world for nearly 1000 years, until Seville Cathedral ws completed. Upon Ottoman conquest it was converted into a mosque, and is now a museum. Recently, work took me to Istanbul to meet with the Syrian resistance. We discussed options for the international community to help bring an end to the Syrian war, by destroying the financial networks that enable the Assad regime to purchase weapons and finance assaults against civilians. As we pored over accounts of massacres, a clawing despair seemed to grip us, and it became difficult to hold on to any sense of perspective. Its history is intertwined with the history of civilization itself, and it has outlasted both the highest triumphs and the lowest terrors nations have known. It became the centre of the state religion, Orthodox Catholicism, as the Western Roman Empire declined and the Eastern Roman Empire arose. It was converted into an imperial mosque a thousand years later, when the Eastern Roman Empire was conquered by the Ottoman Empire. It was secularized into a museum almost five hundred years later, after the First World War delivered the deathblow to the decaying Ottoman Empire. It is difficult to conceive of how much change this building has survived, or how important it remained even as the world order ebbed and flowed around it. Today, it bears the accumulated fingerprints of its Christian, Muslim, and secular eras. Images of Jesus and the Virgin Mary gaze down upon enormous discs bearing the names of Allah and the Prophet Mohammad, all hovering over a vast chamber where the modern Turkish state has banned any religious activity. It also has an unmistakable air of faded grandeur. The ancient mosaics are crumbling, and the rim of its colossal dome now traces a worryingly oblong path atop its walls. Nevertheless, I felt utterly certain that the Hagia Sophia will still be here long after our own age has faded away and been replaced by something new. It was a strangely reassuring thought, which helped me regain some perspective for the work that lay ahead. 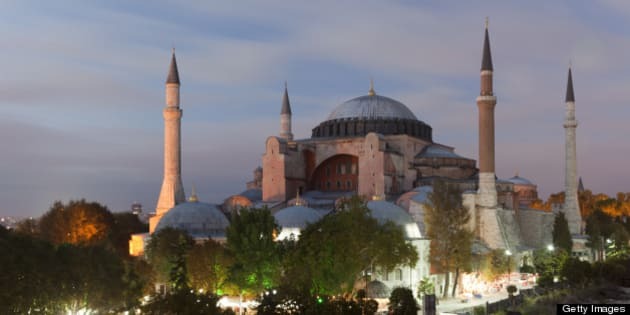 For one-and-a-half millennia, millions of people of different faiths passed through the Hagia Sophia, giving thanks for their joys or seeking solace for their miseries, hoping or fearing that the world would never change. 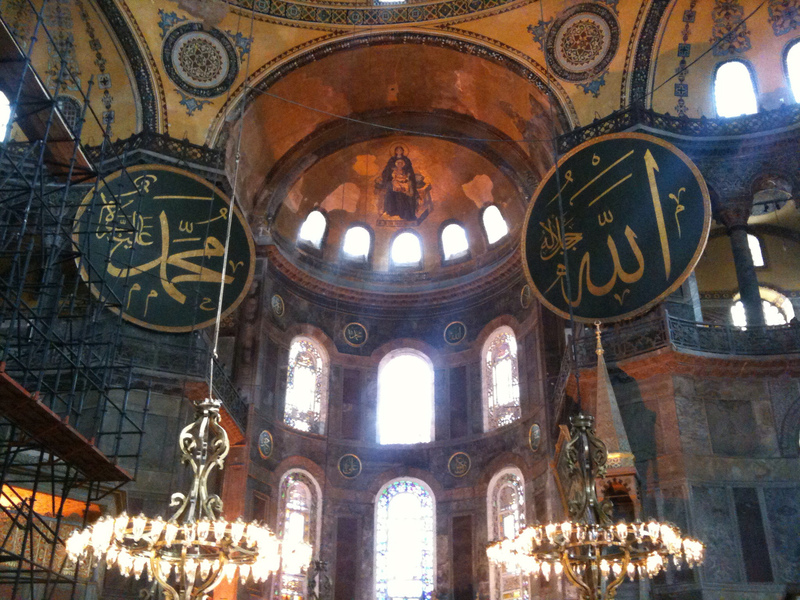 Yet, all the while, the Hagia Sophia has remained a silent witness to the fact that world has done nothing but change. It is a comfort for everyone struggling to change any part of the world for the better. Akaash Maharaj is Executive Director of the Global Organization of Parliamentarians Against Corruption (GOPAC). His personal web site is www.Maharaj.org. Follow his iTunes podcast, YouTube channel, Facebook profile, Flickr photographs, LinkedIn profile, or Tumblr page.